WHITNEY, TX -- When the Lake Whitney State Recreation Park opened in 1954, there wasn't much hoopla made about it. The locals were excited to have access to the 23,560-acre lake, but in the nearest and largest metropolitan areas - Dallas 75 miles to the northeast and Austin 120 miles to the southeast , there wasn't much of a splash. Through the years, however, the legend of Lake Whitney grew. The area developed a reputation throughout the state and the country as one of the finest fishing lakes in all of Texas, with striped bass considered the main draw. As recently as the late 1980s, Lake Whitney was still known mainly as a sanctuary for fishermen. However, during that same time, the property encompassing the water slowly began to increase in popularity as hikers, hunters, and wildlife lovers came to see the various habitat including skunks, deer, raccoons, opossums, rabbits, wild turkey, armadillos, foxes, and a wide variety of birds. In 1992, Double Diamond Resorts, a golf resort development company out of Dallas, decided to jump into the fray. 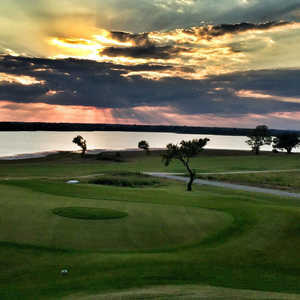 Double Diamond, which owned a four-mile stretch of shoreline appropriately named White Bluff Resort for the numerous white, limestone bluffs located on the eastern side of the lake, added golf to the growing list of things to do on or around Lake Whitney. Interestingly, the lake, which had served as fertile ground for fishing for so many years, was now seen for the spectacular backdrop it provided for an 18-hole championship layout. 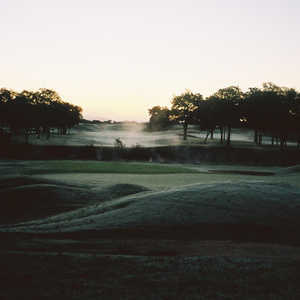 In 1997, Double Diamond added a second 18-hole course. The courses, which were designed by 13-time PGA Tour winner Bruce Lietzke, are quite unique in their design. The Old Course as it is referred, is a challenging 6,866-yard layout that includes water on almost half the holes. Lietzke, who is known as a player who fades the ball, not surprisingly, designed numerous holes that favor the left-to-right player. The signature hole, No. 13, does not feature water or even require the player to maneuver the ball. What makes this par 3 of 158 yards so special is the view. 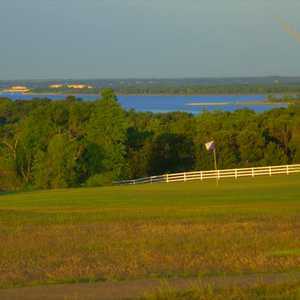 From the tee box to the green, the sparkling blue water of Lake Whitney sits off to the right. The Old Course, according to locals and White Bluff Director of Golf Micheal Hicks, is considered the easier of the two courses. "It's somewhat easier because it has wider fairways," Hicks pointed out. Still, whatever course you choose to play, there are plenty of trees lining the fairways. The New Course is only 98 yards longer at 6,964, yards but length is not where it increases in difficulty. Water is. Ironically, the New Course features no views of Lake Whitney but features the wet stuff on 16 holes. Hicks said there are two types of water holes on the New Course. One, where water is visible and you know where to hit your shot to avoid it, and two, where you can't see it. It's on those holes where you need to be especially careful. "You may not see it, but you'll sure find it," he said. On several holes including Nos. 7 and 16, water comes into play twice. No. 16, a par 5 of 515 yards, includes two creeks that cross the fairway before the green. An accurate tee shot is important on this hard dogleg-right that also runs downhill, so you have an option on whether to go at the green over the two creeks on your second shot. Anything that is not in the fairway and at least to the bend, you must lay up to try and make par. While No. 16 is a fun hole, the most picturesque hole comes several holes earlier on No. 12. This par 4 of 396 yards reminds you of your location as you peer from the tee box at a large white bluff overhanging a small pond. A long iron will be enough club to avoid the pond and put your ball in good position to clear the finger of water that crosses in front of the green on your short second shot. It's a hole truly unique to Lake Whitney. Hicks said in addition to the overall course quality, which includes lightning-quick Bent grass greens, traffic or a lack thereof is another reason to drive the few extra miles to White Bluff. "We don't get a lot of traffic and average around 17,000 to 18,000 per course each year." One thing to keep in mind when you go to White Bluff and play either the Old or the New Course - if your game isn't up to par, there's always that Lake Whitney mainstay - fishing. The Inn at White Bluff has 47 rooms, each with a spacious bath area, private balcony and cable television. 26 of the rooms feature a view overlooking the lake. White Bluff also has one-bedroom and two-bedroom condominiums with views of the lake. Each one-bedroom condominium features a living room with sofa bed, dining area, kitchen stocked with cooking utensils, bedroom with queen-size bed, washer and dryer, fireplace and outdoor grill. The two-bedroom units are similar to the smaller units with the exception of the washer and dryer. White Bluff also has three log cabins for rent. Each two-story cabin, which is located on the New Course, contains a living area with sofa bed, small kitchen, a queen-size bed, two twin beds and one bathroom. The Lighthouse Restaurant serves exceptional cuisine enhanced by the majestic views and breathtaking sunsets over Lake Whitney. Guests can enjoy their meals in the beautiful dining room or on the outdoor terrace. The menu offers selections that include fresh seafood, aged beef, distinctive Southwest regional dishes and traditional fare. For a quick meal, The 19th Hole Grill at the Old Course has a selection of deli-style sandwiches, hot breakfast and lunch and snacks and drinks. The Clubhouse Grill at the New Course features an upscale bar and grill overlooking four holes. There are four swimming pools with adjoining cabanas located throughout the resort. In addition, there are three lighted tennis courts, picnic areas, playgrounds, basketball and volleyball courts, a fully equipped fitness center and a spa. And as most people who come to Lake Whitney know, there is fishing. There is a private, protected marina with 43 covered boat slips, and a double-wide boat ramp, all of which offer convenient access to Lake Whitney. Boat rentals of all types and sizes of are also available. Within 30 minutes is the Hillsboro Outlet Center that is open seven days a week and has more than 100 stores including J. Crew, Nike, Harold's, Fossil, Eddie Bauer, and Ralph Lauren. From Dallas-Fort Worth, take I-35 South. Exit 370 (Spur 579 West) to Hillsboro. Turn right onto Hwy. 22 West. Take the right fork (Loop 180) into Whitney and continue until you reach the traffic light. Turn right at the light on to Hwy. 933 North and travel approximately 6 miles. White Bluff Resort is on the left.